Dallas, Texas – November 11, 2016 – Vintage Tex today announces that its Holiday Open House will be held from 6 pm – 8 pm on Thursday, November 1, 2016 at its shop (603 S Main St, Ste 300, Grapevine, TX 76051) in historic downtown Grapevine. A new holiday collection will be presented ranging from sparkly cocktail attire to casual Christmas day pieces. Wine Fusion Winery will also offer a complimentary tasting of wines. Instagramming, tweeting, snapping, and all other posting is highly encouraged. 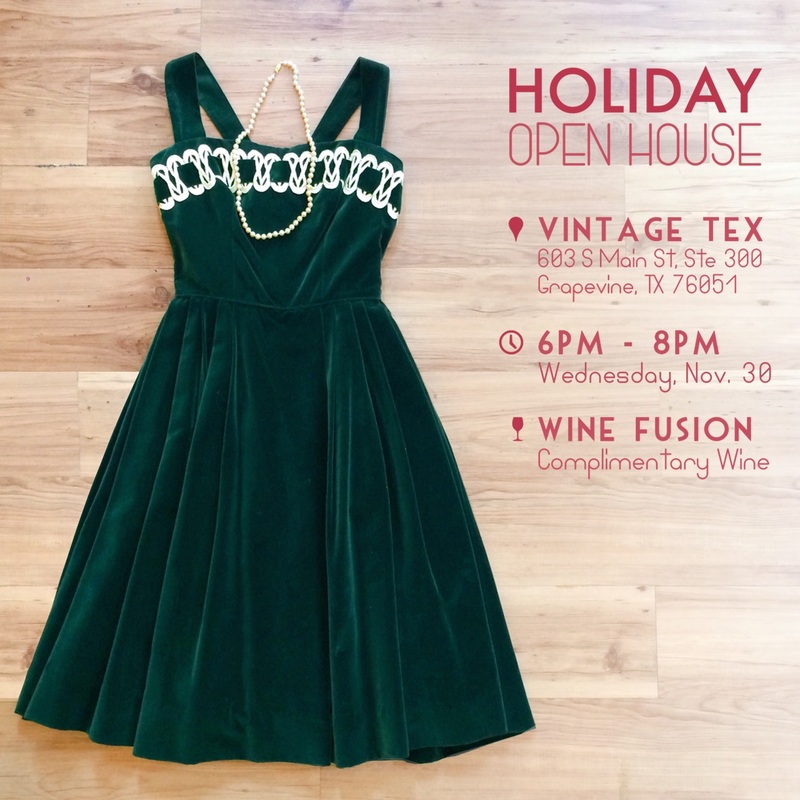 The official hashtag for the event is #VintageTexHoliday. A variety of holiday gifts under $30 will also be available for purchase, including vintage handbags, scarves, aprons, jewelry, and more. Photography is welcome at this event! Vintage Tex Manager Monica Martinez is available for interviews regarding this event. 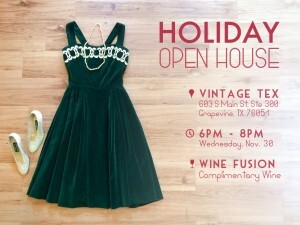 Contact Katherine Rose Watson (katierosewatson@yahoo.com, 972-489-7694) to coordinate. Wine Fusion Winery is the newest addition to the Grapevine Family of Wineries. Located in historic downtown Grapevine at 603 South Main St, Suite 304, Grapevine, TX 76051, Wine Fusion offers a wide variety of wines and food for your enjoyment. The store is open Sunday 1 pm – 7 pm, Monday–Thursday 1 pm – 9 pm, Friday 12 pm – 12 am, and Saturday 11 am -12 am. Wine Fusion was created to help fill the void between novice and experienced wine drinkers. Wine Fusion crafts wines that are ready to drink, not to be stored in a cellar for years on end before you can enjoy. For more information, visit winefusionwinery.com.